I’ve been collecting mentors my whole life. Friendship mentors, dating mentors, cooking mentors, writing mentors and parenting mentors. Cathy is my ‘mother of boys’ mentor. The other day she was in town and we visited over coffee, I hung on her every word. Cathy and her family were our neighbours when I was little. Cathy had long brown hair, a big smile and the best laugh. I once asked my mom if I could change my name to Cathy. The love was strong. 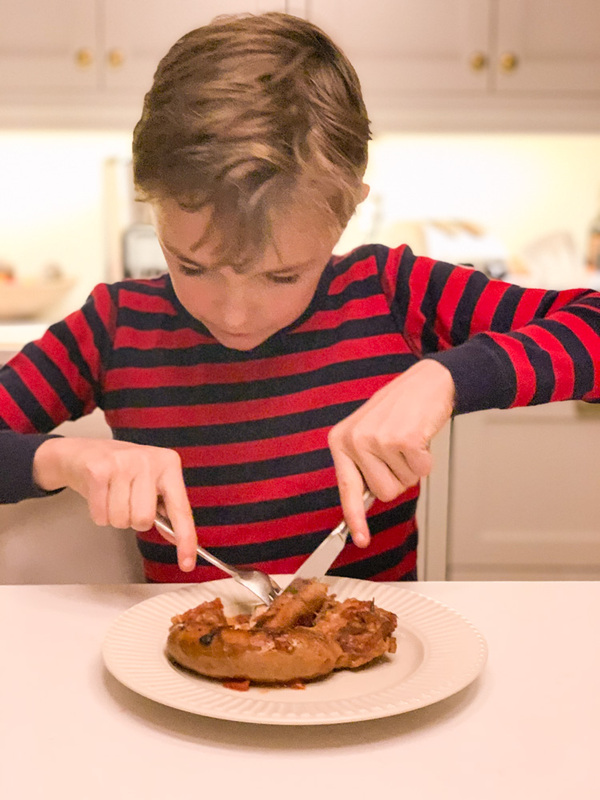 As we sat drinking coffee last week, I told her about my boys, and how we’re into the teenage years with the older two: rapid growth, hormones, fatigue, grumpiness, mumbling, a few smiles and a constant displeasure when I serve vegetable-only meals. “I guess,” I thought, recalling the grunt I got from boy #2 as I tried to hug him as he left for school. Since our conversation I’ve been walking around our little urban back yard, wondering where to put the hot tub. Under the laburnum? Beside the rhododendron? Nestled under the kitchen window so I can listen in on future teen gatherings? Instagram also wants us to get a hot tub. Circular cedar hot tubs are popping up on my feed – the gorgeous, Scandinavian kind. I’ve been over-googling, clearly. I may never get that hut tub, but Cathy’s right: this cusp, it’s a special time. I’m going to celebrate it by not embracing plants for dinner tonight. I’ll make a one-pot meaty wonder – not quite the equivalent of three rotisserie chickens, but close, and the teenagers will love it. Heat the oven to 170C / 325F. Heat 1 tablespoon of the oil in a big heavy pan with a lid over medium heat (use a Dutch oven if you have one*). Brown the sausages and remove them to a big bowl as you go. Wipe out the pan. Add another tablespoon of oil and fry the bacon until crisp. While bacon is frying, tie herbs together with kitchen string. (I’ve let them go rogue before, and long rosemary needles end up everywhere throughout the dish. Not good.) Add onions to the bacon along with the herbs. Cook for 15 minutes, stirring occasionally, until the onions turn ‘sloppy’. Add the garlic, cook for a minute, then spoon everything into the bowl with the sausages. Toss the chicken with the seasoned flour. Heat remaining 2 tablespoons oil in the pan and brown chicken in batches, removing the browned pieces to a plate as you go. When all have been browned, return chicken to the pot and add the red wine, stirring and scraping the bottom of the pan as the wine bubbles. Add the stock and return the sausages, onions, herbs etc to the pan as well. Stir and simmer for 5 minutes. Add can of tomatoes, beans, lemon juice and season well with salt and pepper. Simmer for 5 minutes more, stir, then remove from heat. Place a piece of parchment paper over the surface, letting it rest on the food. Cover with lid (not worrying if the lid catches on the paper) and cook in the middle of the oven for 60 minutes. Stir well, taste and adjust seasoning. Serve with a sprinkle of parsley. *I doubled the recipe and used a big, high-sided roasting pan to cook the dish. It doesn’t have a lid, so I just used the parchment, pressed to the surface of the food to seal. It worked. **Top photo isn’t of a teenager. It’s the youngest, who, truth be told, prefers salads. 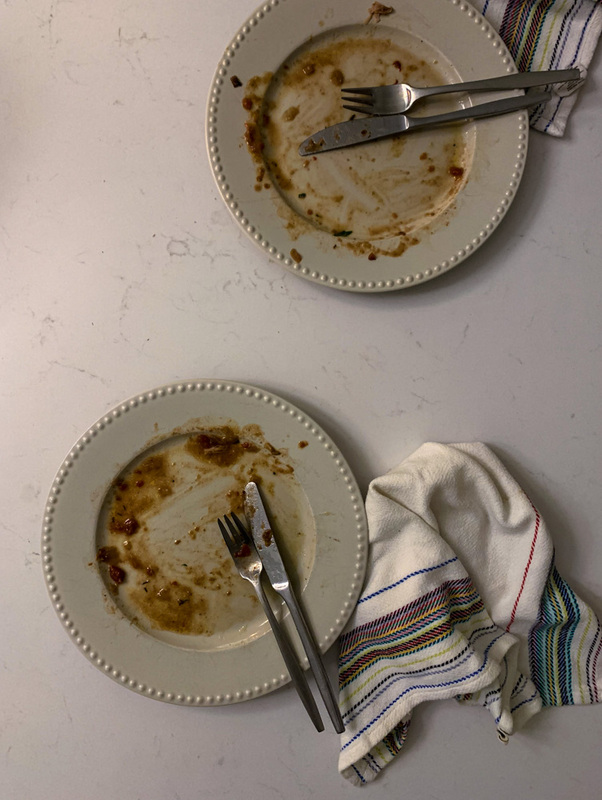 The plates, they belong to the teenagers. Add flavour to your week… sign up for my Newsletter!